Shadow. She is now in a loving pet home. 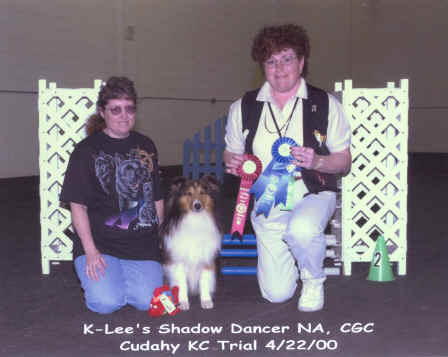 Shadow "K-Lee's Shadow Dancer OA, NAJ, CGC. OFA Excellent, eyes normal. 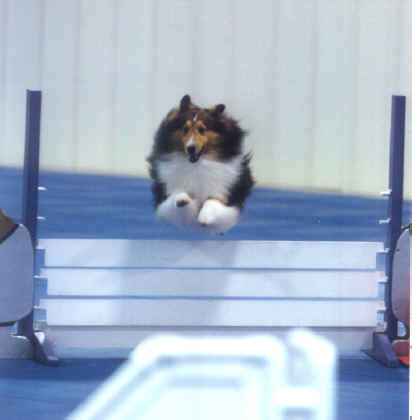 Agility Trial Sept. 25, 1999, Judge Carol Smorch with a score of 98. With a score of 95 and 1st place in his class. 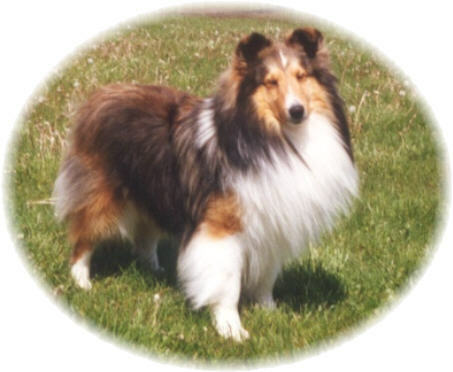 He is started in obedience, and I hope to get his companion dog title for him also. 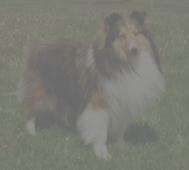 This picture of Shadow was taken at the Sheltie National Agility Trial in Chicago 1997. Marshfield Area Kennel Club agility match. at the Wi. Rapids K.C. show and second in his class. 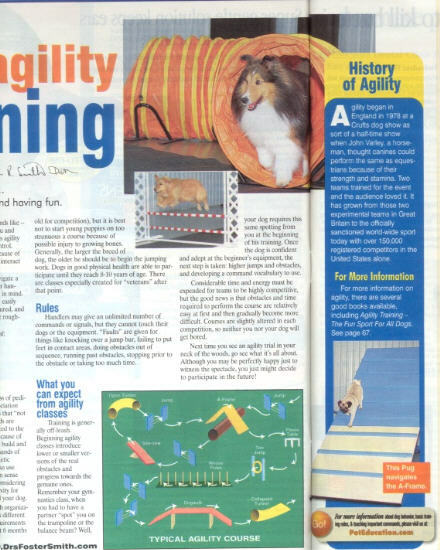 Nov. 11, 2000 2nd Open agility leg with a perfect score and 2nd place. 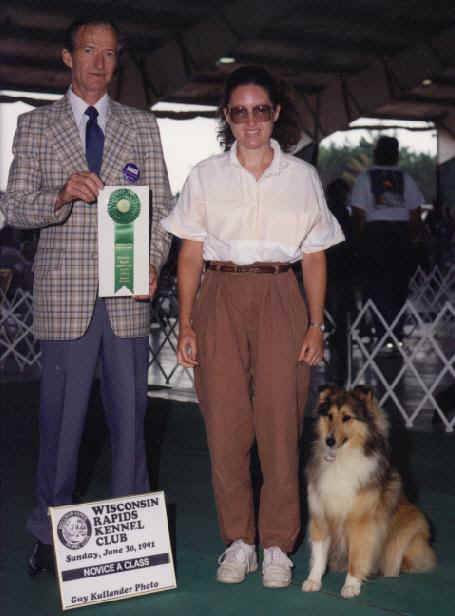 perfect score and 1st place at Timber Ridge Agility club Judge: Sionag Black. OA title, & his 2nd Jumpers With Weaves leg with a perfect score & 1st place. place to get his NAJ title with 3 perfect scores and 3, 1st places. Judge: Diane Craig. At Marshfield Area Kennel Club Agility Trial. So now Shadow is: "K-Lee's Shadow Dancer OA, NAJ, CGC". Nov. 10, 2001 1st Open Jumpers With Weaves leg with a perfect score & 1 place. Judge: Ronda Crane. At Timber Ridge Agility Club. Feb. 17th, 2002 2nd Open Jumpers With Weaves leg. 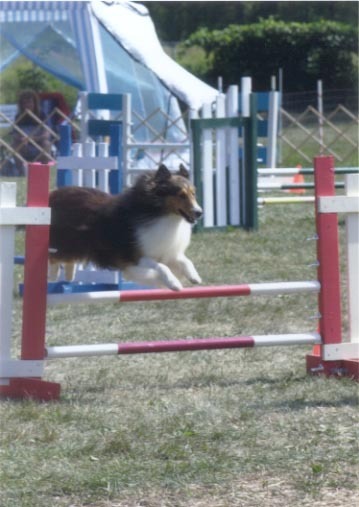 Judge: Sionag Black at Marshfield Area Kennel Club Agility Trial. Good thing he didn't see me wipe out. his 2nd leg in Novice Standard Preferred with a 1st place and a perfect score of 100.